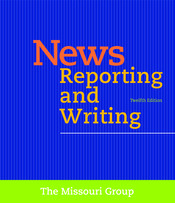 News Reporting and Writing teaches print and digital media reporting and writing. This edition expands further into the digital realm while continuing to stress the essential reporting and writing skills that are the foundation for the profession – past, present, and future, no matter the medium. Now available with LaunchPad Solo for Journalism, a digital platform that combines the News Reporting and Writing workbook, videos, thousands of grammar exercises, and video tools in one-easy-to-use space.